Did you know that Curt Schilling led the league in complete games from 1992-2001? That Tim Raines led the league in hits from 1981-87? That Fred McGriff led the league in home runs from 1987-95? All great stats to argue for your favorite player's HOF admission, made possible by the magic of cherrypicked, arbitrary endpoints. This sort of cherrypicking has been a hallmark of baseball broadcasting for years, but now you can get in on the action thanks to the Baseline Cherrypicker Tool, created by Ben Schmidt. 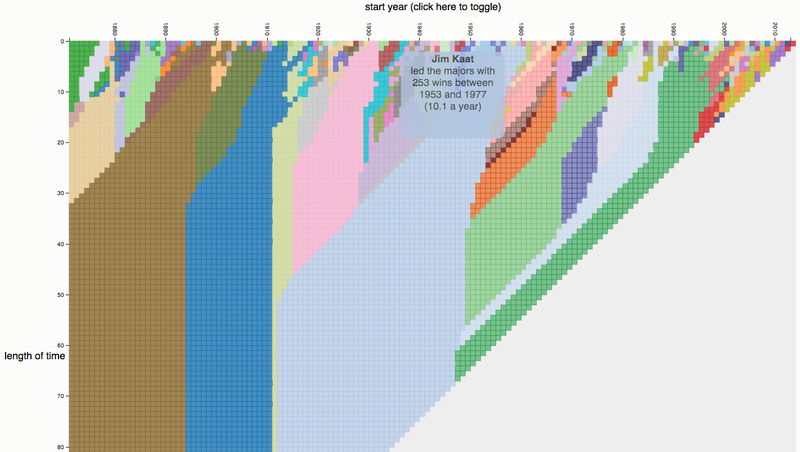 The interactive graphic lets you explore—based on stat, start or end year, and length of time—over 10,000 possible "Player/team A led the league in X from year Y to year Z" statements, from 1871 through 2013. While Raines led the league in hits from 1981-87, he loses the title if you move those endpoints out to 1980-88 (Willie Wilson leads), slide back one year to 1980-86 (Cecil Cooper), or only look at his peak seasons from 1983-87 (Wade Boggs). In fact, 1981-87 is the only span of years—including single seasons—in which Raines led the league in this category.